The Juice Plus+ Childrens’ Health Study (CHS) is one of our greatest tools and the best way to make a difference by gifting the next generation with great health. Be sure to familiarize yourself with that fabulous website so you can guide your prospects and customers to the essential information there. Mission Statement: The Juice Plus+ Children’s Health Study is a nonprofit organization dedicated to improving the state of children’s health and nutrition around the world through its research and educational programs. We recruited our first study participants in the USA in late 1999 with a goal of obtaining 5,000 participants by the end of 2000. That number has now exceeded 1,000,000 (with another 1,000,000 adults) in 14 countries world wide. A parent, grandparent, or other adult in a child or college student’s life — signs up as a Juice Plus+ customer. The Study provides Juice Plus+ Orchard Blend and Juice Plus+ Garden Blend free to their child between the ages of 4-18 or full-time undergraduate college student for up to four years, so long as the adult continues to take Juice Plus+. At various intervals, they will be asked to fill out a simple, voluntary Questionnaire to determine whether (and how) they or their child’s health habits have changed as a result of taking Juice Plus+. It’s that simple! The adult and child can remain in the study for up to 3 years. A 4th year is added to those who complete the full 3 years in the CHS; they will receive free product for an extra year as a ‘thank you’ – no survey data will be requested for that 4th year. As an incentive to encourage families to participate, the Health Study is providing the child’s Juice Plus+ product for free, as long as the parent (or other adult) begins taking Juice Plus+ too. This requirement is in keeping with our belief that parental support and involvement is the key to successfully establishing good health habits in children. It also helps ensure the high survey response rate necessary for meaningful results. 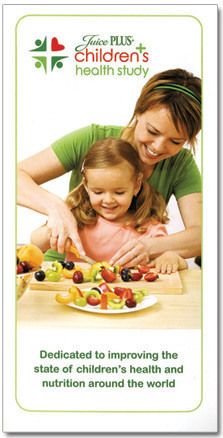 So, by participating in the Health Study, a family of four can enjoy Juice Plus+ for less than $3 a day! nutrition from fruits and vegetables to your family’s diet — for less than 75 cents per person per day. While The Juice Plus+ Company covers the majority of the cost of this program and the free product, we each make a small contribution to fund the Study. For 2018 changes have been made to even out the contributions: details. The paying adult customer also pays the $7 shipping charge on the child’s product (divided by 4 if they are paying monthly). The child’s product is ALWAYS shipped with the adult’s, so if the adult does not live in the same household (eg. a grandparent) they must arrange to get the child’s product to them every 4 months. A child can be sponsored into the CHS from 30 days before their 4th birthday. There is NO upper age limit in the CHS, as long as they are a full time student. This is mainly in order to support those young men and women who join our military before going to college. You are required to provide a college student’s email address and the name of the college attended. Students attending a 2-year Community or Technical college also qualify for the CHS – they deserve good nutrition too! Special cases are often considered and allowed by our “Company with a Heart”. For example, a “special needs” adult, who cannot attend college or get a job can be sponsored into the CHS; just enter “special needs adult” in place of the name of the college and the parent’s email in place of the student’s. product (including the period when they were canceled). If you have an adult or a child of 13 or older who would prefer the chewables, you can request an exception. Print out the Children’s Health Study Order Form, fill out the form and anywhere in the margin write “Child/Adult must receive Chewables”. Then fax that form to the number in the top right corner of the order form. You can choose Juice Plus+ Chewables for the adult and/or for the student (13 or older) as a standard option. You can convert any duo or trio order to a CHS order by calling or emailing support@juiceplus.com. Combined with the CHS, the Healthy Living Partner Plan is a powerful team building tool.